I'm afraid that I'm making another lousy post again. Why? It's because the past week was just all about work. August is a blessing of overflowing work for me. When the month ends, I can hopefully accept more work (heehee) in time for my favorite time of the year. 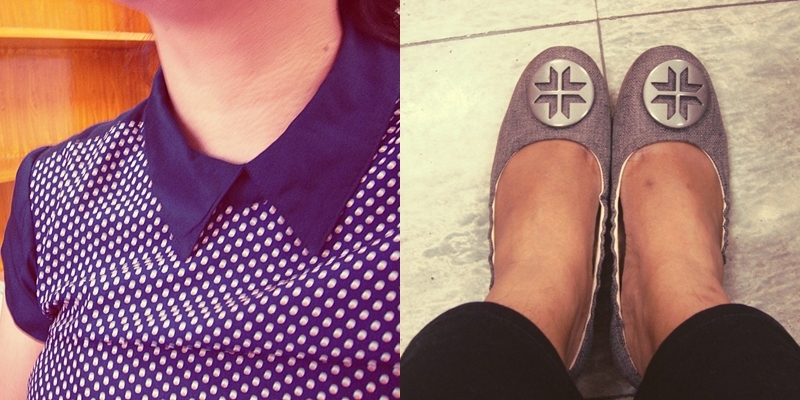 Setting aside that serious side of my life, here are snippets of the few beautiful things that made my week. How can you get more excited than this! Bubbatealicious' Milk Tea after a long day at work! My favorite variant is Wintermelon. How about you? Do you also like milk tea? Wearing my old military inspired jacket since it's been raining over the past days. My Sunday post will never be complete without all my foodie adventures. I know its unhealthy but I've been a fan of 7-11's hotdog sandwiches and Manhattan dressing. Pan de Manila Sardines in Tomato Sauce - I've been reading positive reviews about Pan de Manila's line of sardines. When I had the chance to drop by one of their branches, I took home a bottle to finally experience everyone's recommendation. My verdict? The best! Tous Les Jours (TLJ) Bakery - I discovered TLJ from my friend A. We thought that it's one of those expensive French bakeries. It's French but to our surprise, it's a Korean based company. We love TLJ because of their closing time sale. Most of their bread are sold 50% off price around 9 pm. All the while, I thought that they only exist in Greenbelt. I recently discovered a nearer branch on the way home. Hooray! 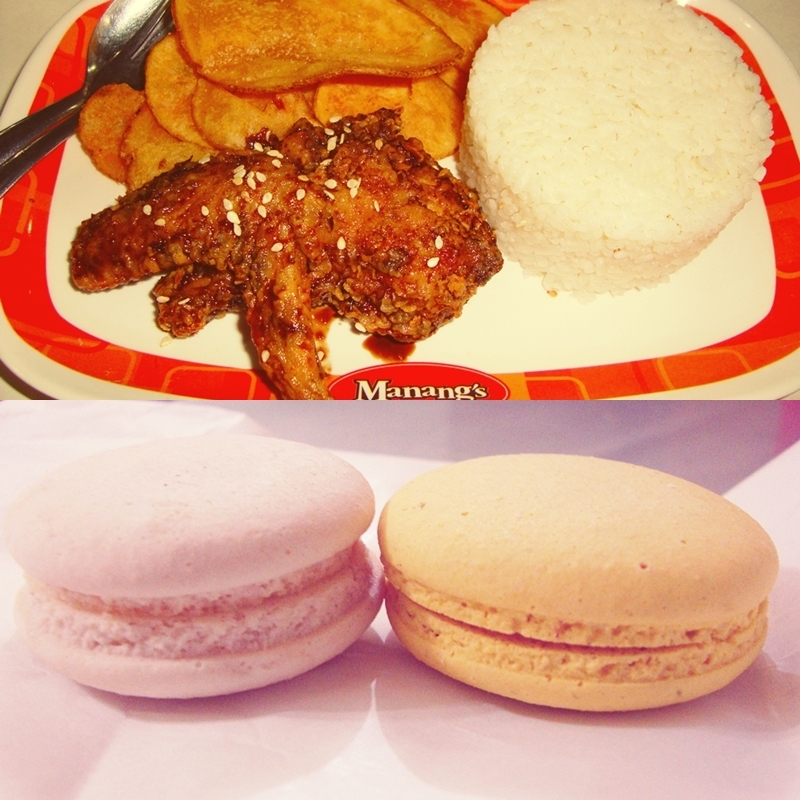 French Macaroons from TLJ - Not the best, but the cheapest at Php 28 each. Those who have been following me on Instagram (dianewrites) are very familiar with my French macaroon addiction. I got this box from French Baker for Php 192. The happiness lasted only a few minutes :) but I tell you, this is the best among the cheapest French macaroons in Manila. How about you? What are the beautiful things that made your week? I would like to believe that I had a rare productive weekend. Yes, it was rare! Over the past months, weekend for me means sleeping more than eight hours, reading my hopeless romantic paperbacks and watching my dose of Korean drama series. Surprisingly, everything started out early last Saturday. My day started with my monthly visit to Ms. Orthodontist. It was time to tighten the toothy metal wires again. I later headed to the house of my dear friend M. I shared my little knowledge in Statistics to M because she needed it for her project (Yihee, may raketship si M! haha). 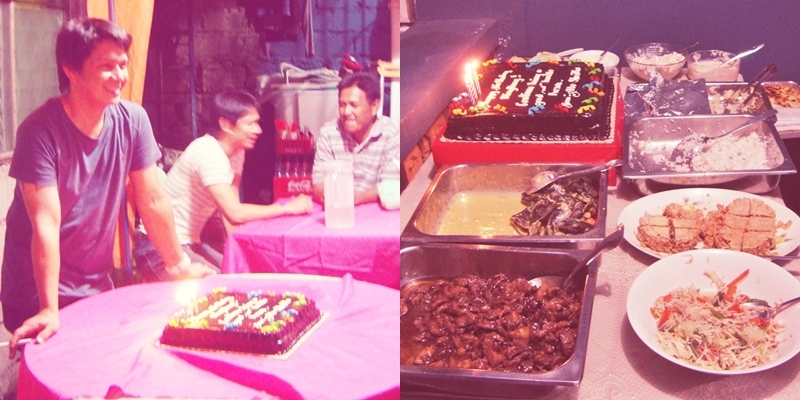 My day ended with a birthday party and mini-reunion with my Fun Fab Fam. Someone turned YOUNGER! Happy Birthday Kuya D! Thank you dearest cousins. Hope we could do this more often. While I always look forward to weekends, weekdays gave me its own set of beautiful things. No lectures and classes for a week! Half of the semester is over and it will be examination week tomorrow. While I'm spared from rendering lectures, I have to spend the next week checking papers and preparing status reports. 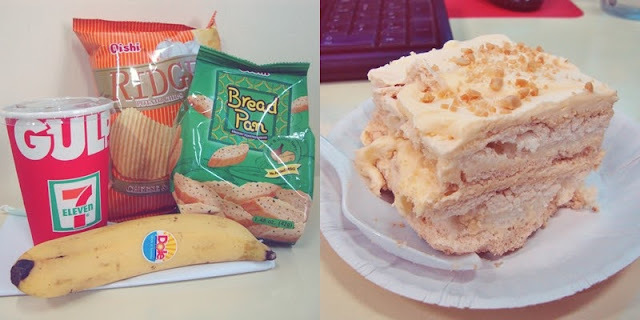 I will never miss a Sunday series without my overflowing food posts. 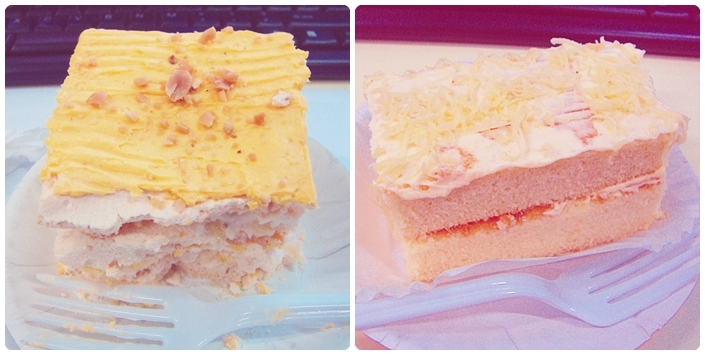 On the second photo is a very sweet Sansrival slice from the workplace's cafe. It was too sweet to keep me awake and even threatened me for a possible sore throat. After having a full dinner, A and I dropped by Tous Le Jours to avail of their closing time sale. 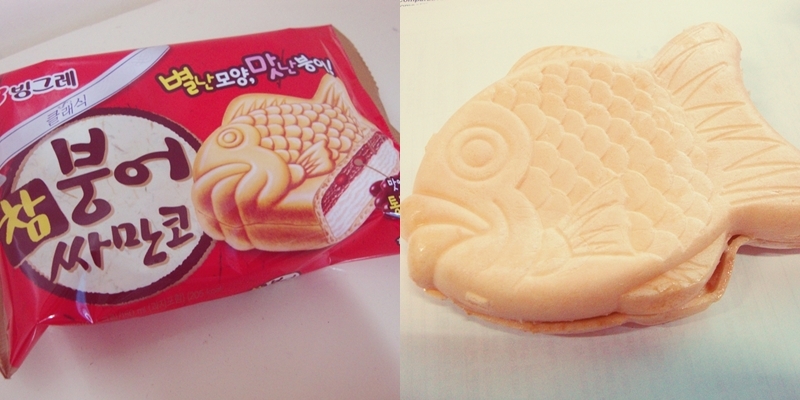 It was my first time to try this Korean based bakery. I managed to take home a few bread and two pieces of these little treats.